Plenty is written about the Chinese economy; but plenty more needs to be understood. 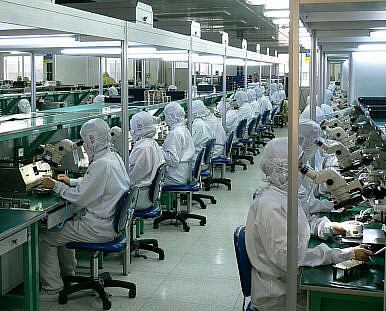 China is not as unequal as some think. It has become commonly accepted that China has not only been catching up with the non-Communist West in terms of wealth gaps, but has actually surpassed it. In 2014, a much-trumpeted research paper from the University of Michigan concluded that “income inequality has been rising rapidly in China and now surpasses that of the U.S. by a large margin,” with a Gini coefficient of 0.55 vs 0.45 in the U.S. This is backed by empirical evidence of the disparities that exist side-by-side in large cities such as Shanghai and Beijing. However, much of the work done on coefficients has relied on income distribution. Look at the data from another perspective and the results are quite different. On an asset distribution basis using data from Credit Suisse’s Global Wealth Report for 2015, the numbers show that China is still towards the lower end of the scale. 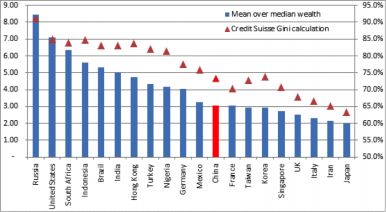 Calculating on a simple basis of mean wealth per capita as a multiple of median, my calculations show China to be significantly more egalitarian than other emerging markets (most of all Russia) or the U.S. Credit Suisse’s own internal asset-based Gini number confirms this. So why is this the case? The reality is that much of this has to do with the large transfer of wealth to the urban household sector during the reforms of the late 1990s under Zhu Rongji. According to Arthur Kroeber, the value of these transfers equated to around one-third of China’s GDP for 2003, meaning that while incomes are not growing, the middle classes have been endowed with a substantial asset base which is as meaningful an evaluation of wealth as incomes are, particularly in an environment of relatively stable house pricing. Growth is not being driven by debt. With all the concerns about Chinese indebtedness over the last couple of years, one would imagine that the huge infrastructure projects that the government is backing through initiatives like “One Belt, One Road” (now referred to as “Belt and Road”) are being funded by borrowing. Yet if we drill down into the numbers, the vast majority of fixed asset investment is being funded through equity. Indeed as a proportion of overall FAI, the equity piece has been steadily growing since the 2008 stimulus and has now reached over 70 percent. Debt exposure is being somewhat over-reported. Why is this? Well first, the vast majority of corporate expenditure is normal business start-ups, not just major infrastructure projects. While the headline investments make the most noise, on the ground China continues to be an economy that sees tremendous entrepreneurialism and start-ups not only in technology but across the retail-facing industries. Chinese innovation should not be underestimated. China is a place to start businesses, in a way only rivaled by the U.S. and far ahead of regional peers such as Japan (has anyone heard from a Japanese start-up recently?). Indeed, this Chinese appetite for equity is one of the most important dynamics across the world, and may eventually have knock-on effects on public markets too. Second, and intriguingly, it also seems that the huge rise in corporate borrowings that has been reported in the last few years has not been drawn down for capex spending, and certainly not on white elephants. Instead, as reported by Dragonomics, corporates have been largely bolstering their cash balances and/or using loans to make financial investments, mostly liquid. Technically this may or may not count towards “net cash” but it certainly is not money “spent.” Netting this off may reduce the perceived debt number quite substantially. A longstanding complaint about Chinese economic performance has been the failure of “rebalancing,” a phrase which is used constantly by the government itself. Central to this charge has been the assessment of consumption as a proportion of GDP growth, which for more than a decade has been overshadowed by investment-led growth, hovering at or around 50 percent with private consumption even lower. The government itself has vowed to raise this. Yet in context, these numbers are not so bad. Yes, as a proportion of growth consumption did fall during the 2000s, but this was because of the exceptional investment that was happening during this time. Actually consumption – aka “good growth” even for skeptics – has been extremely stable, averaging 4.6 percent since 2008 and 4.8 percent since 2000, even as overall growth ballooned to the highs of over 12.0 percent. Meanwhile, even as headline GDP has begun to slow, consumption remains relatively robust, resulting an incremental addition to Chinese buying power of about half a trillion US$ in 2015. As a standalone figure the 2015 increase is sandwiched neatly between Norway and Austria as the world’s 28 largest economy in nominal terms and 27th (just above the Netherlands) at PPP. Many other countries would kill for such numbers, and the evidence of ongoing Chinese consumption is all around us, not least empirically through national trends and events such as this year’s record-setting Singles Day shopping spree. It is certainly still growing – and fast. China has almost passed the middle income trap already. There is constant talk about how China is falling into the middle income trap – the problem of “getting old before it gets rich” as The Economist puts it. And of course, there is certainly a long way to go, yet in the world beyond Asia there is still a widespread misunderstanding of how wealthy China is already. An investment banking analyst recently pointed out the fact that China’s GDP per capita at PPP, in current U.S. dollar terms, is somewhat within sight of what Japan’s figure was back in 1990, the point at which that country was widely touted to have “arrived.” This claim is not without its problems of course: For a start, many would question the validity of the PPP formula as a means of comparison; second, at $14,239 vs $19,230, being within sight is still roughly a quarter poorer, not the smallest of margins. Still, it is something to think about. After all PPP, for all its faults, is still the best proxy we have for attempting to compare across economies in time and space; and as for 25 percent, well I suspect rather a lot of people would be happy enough to be within such a small relative distance. However, the point also begs other comparisons. Japan was in many ways exceptional and had a long history of economic development. Meanwhile, Korea, whose own model of mixed economy is more reminiscent of China’s, was admitted to the OECD in 1996 when its own GDP per capita figure was the same as that of China today. Is China equivalent to Korea in 1996? Or Japan in the mid 1980s? Another consideration is that of urban-rural divide – a contributory factor to the inequality story outlined above. China’s national GDP is still a reflection of an urbanization rate of just 50 percent, far below either Japan or Korea. 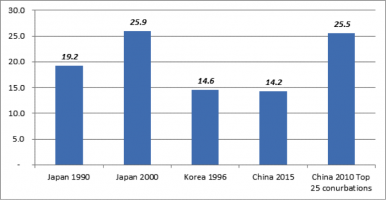 It is therefore instructive to look at China’s urban GDP per capita figures, which, according to the OECD, bring it more in-line with Japan around 2000 (or Korea in 2006). None of these points are designed to argue against an overall story of China slowing down. But in the constant muddle of analysis about China both internally and externally, such counterpoints are useful for at least coloring the narrative. Andong Peng is a former public policy researcher at Tsinghua University, and currently works on UK-China trade relations. China’s Efforts to Boost Consumption: Are They Enough? The government is trying to restructure the economy, but it needs to do more.